This lid works so well with the 32cm stewpan that I wholeheartedly recommend it. I second the review that suggests that it could double as a shield - a testament to its build quality! 312 customers found this review helpful. Did you? Yes, I did! This lid is ‘built’ the same way as the Falk pans, stainless steel bonded to heavy gauge copper possessing the same heat transfer and strength and durability properties. 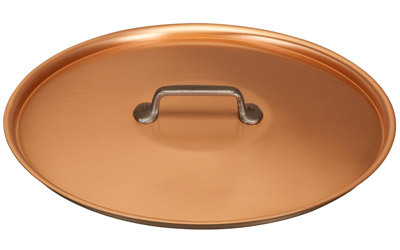 This is the perfect addition to any Falk 32cm round pan; great on the stove top or in the oven. This is possibly the largest lid currently in the market that has all the benefits of copper with a stainless steel lining. Some other major copper cookware brands have resorted to reduce the quality of their lids hoping the customers won't notice. They have resorted to a thick (>1mm) stainless steel lid with only thin a very thin copper lining. Such lids that are predominantly stainless steel tend to stay much cooler. Falk Culinair on the other hand have not compromised even for their largest lid, and I am glad to say that they have stuck with quality. The lid is 1mm copper with a 0.2mm ss lining. This ensures that the lid gets very hot, very quick and the food cooks better and faster. Ultimately it is all about tastier food on the table. I genuinely can't wait to collect the rest of Falk's 32cm pots. I used this lid for my copper stew pan 32cm. This combination is very useful. The size is perfect for more people. Its a lid - does not fit quite as well as the smaller lids do for smaller pans. 547 customers found this review helpful. Did you? Yes, I did! Extremely well made and attractive. 507 customers found this review helpful. Did you? Yes, I did!